The 12th video presentation from the Worldwide Exemplification of Freemasonry is now available. This week's program is "The Royal Secret in the U.S. before 1801" by Dr. S. Brent Morris . S. Brent Morris 33° is the managing editor of the Scottish Rite Journal of the Supreme Council, 33°, S.J. A former mathematician with the federal government (he holds a PhD in Mathematics from Duke University), he has lectured at over 100 universities, and has taught mathematics, computer science, and cryptanalysis at Duke University, Johns Hopkins Universities, and the National Cryptologic School. He is currently on the graduate faculty at George Washington University. He was the first American to be elected as the Worshipful Master of Quatuor Coronati Lodge, the oldest Masonic Research Lodge in the world. Among his many books are The Complete Idiot’s Guide to Freemasonry, A Radical in the East, and Is It True What They Say About Freemasonry? co-authored with Art de Hoyos. 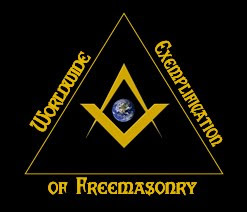 The Worldwide Exemplification of Freemasonry 2011 Lecture Series is a free presentation of Masonic education endorsed by the Grand Lodge of Indiana F&AM, beginning January 1, 2011 and running through December 31, 2011.